President Obama is requesting fiscal 2012 funding for an edtech agency within the Department of Education, along with a $2 billion grant program to fund sharable, web-based tools. Advanced Research Projects Agency – Education would support research on breakthrough technologies to enhance learning. 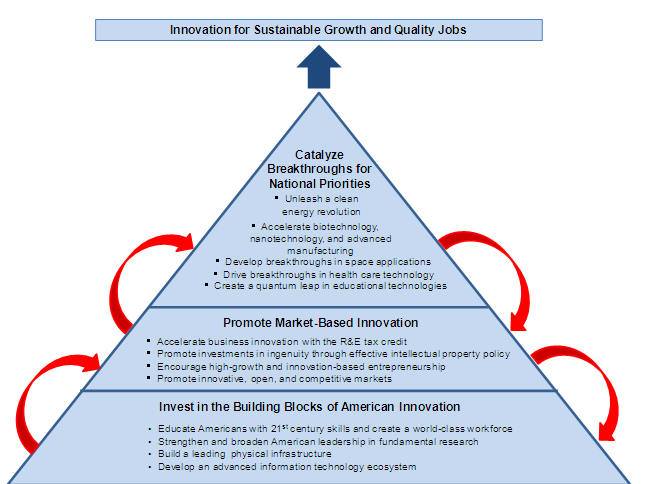 In order to “Create a quantum leap in educational technologies,” a point outlined in the Administration’s Strategy for American Innovation, the U.S. should “foster innovation in technologies that have the potential to dramatically improve student performance.” The strategy, viewable on the White House web site, names software that is effective as a personal tutor, as an example. Of course, this is all proposed, not confirmed, so stay tuned…and comment below, or go over to Linkedin where you can sign up and join in on the discussion started by Brian Foor of the Consortium for School Networking (CoSN). Also, note point #5 on the top block of the pyramid pictured (click for larger image).